Can you identify *too often*? See Regulation #6 on page 19 of the 1947 Canadian Radio Annual. This requires that each station announce its call letters at least once, but not more than four times, an hour. KQDE, permit for new station canceled. The FCC has been doing some housecleaning. They've also deleted a stack of inactive LPTV licenses/permits, and a number of idle LPFM stations. This is also renewal time for most stations in the South, with hundreds of renewals going on Public Notice. Directional, different patterns night & day. Later amended slightly to 600 watts daytime and 31-29-58N/100-24-22W. 5,000 watts day & night, directional, same pattern. This is authorized as a Class B station. Usually, only Class C stations (with a maximum power of 1,000 watts) are authorized on 1450KHz. To my knowledge this is the only Class B authorized on a Class C channel. CBTD requests move to FM. The station plans to move to 91.3 FM at a different site. Directional, different patterns day & night. Amendment from 1,700 watts daytime/350 watts nighttime, directional only at night. New station KGGS on the air. WRGC has refiled to move from 680. This station is reportedly off the air. KOTC has refiled to move from Kennett, Missouri. The decision doesn't say, but it's probably directional day & night with different patterns. To be local news/talk for Mississauga. CKGM granted move from 990. 50,000 watts day & night, probably non-directional. 50,000 watts day & night, directional status unknown. 50,000 watts day & night, directional all hours, different patterns day & night. The stations that were granted 940 and 990KHz had both requested 690, but the CRTC felt CKGM could make best use of the channel. License surrendered to FCC for cancellation. I don't normally report on format changes, but this station has been the first New Mexico logging for quite a few people..
KCKN-1020 Roswell, New Mexico has been sold to Radio Vision Cristiana. This is a Hispanic religious group responsible for stations like WWRV-1330 New York City and a station on 530 in the Caribbean. WECU new on the air. Winterville is in Pitt County near Greenville. CBXK proposes move to 91.5 FM. CFOB-1 proposes move to 95.9 FM. Early reports suggest Wednesday afternoon's national EAS Test didn't fare very well. At least at our station (in Nashville) the voice message was fully intelligible and of decent quality. I have heard from several parts of the country where the message was distorted or noisy to the point of being unintelligible. In other parts, the message was completely non-existent. Reportedly the test didn't happen at all in Oregon and in several other smaller areas. I suspect we will be seeing a repeat of this test early next year. Please chime in with your observations. Power to 2,700 watts daytime; 24 watts nighttime, non-directional. 20,000 watts day & night, non-directional. The FCC has refused to allow the licensee of an FM translator to offer smartphones as a solution to interference to FM radio reception in Michigan. A new radio station was launched in Detroit in April. Smooth jazz station "Oasis 104.7" broadcast over the HD2 subchannel of WGPR-107.5 -- and in analog over translator station W284BQ. FM translators are not allowed to cause interference to full-power "regular" FM stations. Even if the normal engineering methods suggest no interference should occur, if complaints of actual interference are received, the translator must either make technical changes to eliminate it, or cease operations. Translator W284BQ operates on 104.7 in Detroit. When it began operation this spring, listeners in Ypsilanti, Belleville and Taylor, Michigan contacted full-power station WIOT, on the same frequency in Toledo, Ohio 50 miles to the south, complaining of interference to WIOT's signal. In July, the owners of W284BQ modified its antenna to reduce signal to the south, in the direction of the complainants. This seems to have resolved five of the 28 complaints. Another thirteen could not be contacted or refused to cooperate; and one doesn't listen to WIOT anymore & doesn't care about the interference. W284BQ offered the remaining nine complainants free smartphones with the iheartradio.com application. This can be used to listen to participating radio stations online; WIOT is one of the stations that participates in this program. The translator agreed to pay both for the smartphone hardware, and the airtime charges. Eight of the nine accepted the offer. - It's not entirely certain W284BQ would continue to pay the airtime fees indefinitely. WIOT also mentioned 58 additional complaints. While they didn't explicitly say so, it would seem the smartphone solution doesn't do anything for listeners who might not listen to WIOT now, but who might hear the station & decide to listen to it in the future -- unless they can't receive it due to interference from W284BQ. - Who's responsible for maintenance? If one of the smartphones is damaged or lost, will the translator pay for its repair or replacement? - How can a cash-strapped FCC monitor & enforce compliance with such an unusual solution? The Commission has decided W284BQ's solution is not workable. Pursuant to regulation 74.1203, a translator that interferes with a "regular" station must be shut down -- and the FCC has so ordered. New station KKMP on the air. 1,100 watts day & night, non-directional. As part of a large round of budget cuts, the BBC has announced they will not maintain their longwave transmitters on 198KHz. The move "...will lead to the end of Radio 4 on LW in the long term." Transmitters in Guernsey (1116) and Jersey (1026) are reportedly exempt and will continue. None of these frequencies are particularly powerful; only the most well-equipped American DXers would stand much chance of logging any of these. The FCC has denied a petition to waive the underwriting rules for non-commercial FM stations, to allow five stations owned by Network of Glory, Inc. to air commercials. Network of Glory claims that the poor economy has made it difficult to obtain grants and underwriting for the operation of their stations. FCC regulation 73.503 allows non-commercial stations to acknowledge contributions on the air -- so-called "underwriting" announcements. This page explains what's acceptable in an underwriting announcement. Basically, non-commercial stations may identify their contributors, indicate where contributors' businesses are located, and indicate what type of business the firm conducts. They may not compare their contributors' products/services to those of other firms or issue a "call to action", asking listeners/viewers to buy something from contributors. Network of Glory apparently feels these regulations are too restrictive, are making it difficult for them to obtain enough support to continue operation. All five are fairly recent stations. Permit for new station expired. This was not an operating station, but a permit for a new operation. CKSQ applies to move to 93.3 FM. Some hams may remember something called "controlled carrier". ISTR this feature was installed in my Heathkit DX-60 ham transmitter. The idea was to adjust the level of the AM carrier signal dynamically, as the level of the modulating audio changed. If your 500-watt AM transmitter is only being modulated 50%, you only need 250 watts of carrier to avoid overmodulation; the remaining 250 watts are essentially wasted. Apparently this feature has been available in broadcast transmitters for some time, and used by high-powered stations overseas. It's also been tested domestically on KOTZ-720, Kotzebue, Alaska. The FCC has now authorized its use in general by U.S. AM stations. Stations wishing to use it must request a "MDCL Waiver" of 73.1560(a). 690: Dufferin Communications, for a LGBT-oriented station, in French. CKGM, to move their English all-sports station from 990 to 690. 7954689 Canada Inc., for a French news/talk station. 940: Metromedia CMR, for the originally-planned English-language traffic station. 7954689 Canada Inc., for an English news/talk station. Metromedia CMR dropped their application for a new French traffic station on 690; they have instead converted their existing French news/talk station CKAC-730 to an all-traffic format. CKGM's application is a bit of a surprise; can't say I'd expect the CRTC to approve an application that would involve changing the language of the big 690 signal. I'm not entirely sure whether there's a well-known company behind "7954689 Canada Inc.". The email address on the application is that of a Nicholas Tetrault, who comes up on Wikipedia as a BQ candidate for Parliament in the 2000 election. This 10,000 watt AM relayer of FM 102.1 from Matane, Quebec is to be replaced by four FM transmitters in Quebec. 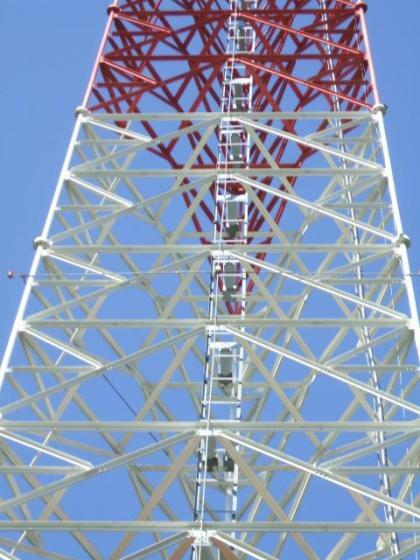 This 50,000-watt station in eastern Iowa suffered transmitter damage as the result of a July windstorm. There is no timetable for returning to the air. At my Nashville-area location, CHIN Toronto will probably be the main beneficiary of KXEL's absence. I would imagine WDCD Albany, NY will the the most heard 1540 station in the east, and ZNS-1 in the Bahamas is another likely target. Here is a link to KXEL's website. This 50-watt station, previously known as CKDR-6, has applied to move to 96.9 FM from the same site and with the same power. Such moves are almost always granted, especially in rural places like Atikokan where there is little risk of technical conflict. WIPS license canceled at request of licensee. KMYN on air with new facilities. Isleta is just south of Albuquerque. A Little Rock radio station has been sued for failing to inform an advertiser of reduced coverage due to a transmitter failure. According to this article on the ArkansasBusiness.com website, KARN failed to inform Custom Satellite Solutions that their transmitter was operating at 2,500 watts, instead of the normally licensed 50,000-watt facility. As you might guess, Prescott Valley is just east of Prescott in north-central Arizona. If you've been following this blog for awhile, you've followed the on again, off again saga of 690 & 940 in Montreal. - and, just a few days ago, that the applications had been removed from the agenda for the next CRTC hearing. Well, now we know why... and it does not mean the new applications are dead. Rather, after reading interventions filed by third parties, the Commission felt they needed to solicit competing applications for new AM service in Montreal. Only the 690 and 940KHz frequencies are involved. Beaver is in southwestern Utah. CBUL has applied to move to 92.7 FM. 1. 600KHz: 250 watts daytime, 50 watts night, South Asian. 2. 1400KHz: 1,000 watts day & night, South Asian. Would go to 1610KHz when existing CJWI moves to 1410. Mutually exclusive with #4. 3. 1530KHz: 1,000 watts daytime only, French contemporary Christian. 4. 1610KHz: 1,000 watts day & night, Spanish. Mutually exclusive with #2. Application filed for new AM station. 2,000 watts daytime; 280 watts night. The applications to reactivate the 690 and 940 frequencies in Montreal have been withdrawn from the agenda for the CRTC hearing on July 18th. At this time they have not been completely withdrawn -- they will be heard later -- so the return of these frequencies is still possible. New AM station on the air. KQTE has filed for a license to cover. 250 watts day & night, non-directional from a single tower at 34-44-26N/117-21-50W. This was a permit for a new station, never built. Station had been off the air for more than a year. Bott Broadcasting, a national religious broadcaster. 350 watts daytime, 250 watts night, directional day & night with different patterns. Competing application at Chico, California dismissed. Application for new station amended. to 800 watts daytime, 250 watts nighttime. Directional day & night, different patterns. Frequency amended to 1330, and site changed slightly. power to 5,000 watts daytime, 25 watts nighttime, non-directional day & night. The operation at Alamo Community has been replaced with KABR-FM 88.1. Isleta is an Albuquerque suburb. This is (was) the standard-band side of expanded-band station WDND-1620. WDOD-1310, the first radio station in Chattanooga, Tennessee, has permanently left the air. The transmission facility has been sold to a local school; the towers will be removed. One of your better opportunities to log North Dakota is temporarily off the air. The Upper Midwest Broadcasting website reports the station's three towers in West Fargo suffered serious damage in a Memorial Day storm. Photos on the station's blog show at least one tower collapsed completely, and the upper portion of another tower bent over. ...we’ll be back on 970 WDAY earlier instead of later… perhaps much earlier! 35-29-51N/105-40-20W, about 25 miles southeast of Santa Fe. The FCC requires new AM stations to have a minimum nighttime power of 250 watts, or a minimum nighttime signal of 141mV/m at 1km from the antenna. This station obviously proposes a lot less than 250 watts, but a signal of 441mV/m. How they are able to do this with a non-directional antenna I have no idea. A message on Radio-Info.com quotes a local TV report as stating two new AM stations will launch in Montreal later this year. The former all-news, and before that, CBC, frequencies 690 & 940 will be used. Both frequencies will carry continuous traffic reports. Looking in the Industry Canada database, both licences were canceled on February 22nd of last year, after their previous owners took the stations silent. Last Tuesday, May 10th, new technical proposals were filed for use of the 690/940 frequencies. 940 would operate in English, from 45-38-58N/73-42-51W. 690 would operate in French, from 45-30-00N/73-35-58W. Yes, it's ironic that two different sites are proposed. Neither proposed site is the same as that previously used by the stations, and neither site is the same as any other current or recently-defunct station. No power or antenna pattern is given for either frequency. I haven't seen anything clear the Canadian Radio-television and Communications Commission yet. I would expect they will need to sign off on this. These stations were of course widely DXable in both their previous incarnations. The other side of the coin... is that if you're east of the Rockies, you need to clean up on 690KHz now, while the big Montreal signal is still silent. Real plums like Vancouver and the low-powered station in western Nebraska may be ripe for the picking. KBRV granted move from 790. All four stations were deleted for remaining off the air for over a year. Three of them are co-owned. Seven FM stations, most if not all co-owned with the three AMs, were also deleted for the same reason. Osceola is just east of Elkhart in northern Indiana. Application for new AM station dismissed. This station last operated on 1550KHz from Clarksville. Its transmission facility was destroyed in last May's floods. They already held a permit for the move to Goodlettsville on 830KHz. That permit has now been constructed. The AM station simulcasts WPRT-FM (102.5 Pegram, Tenn.) HD2 and its two translators W270BK (101.9 Clarksville) and W271AB. (102.1 Nashville) Format is urban gospel "102.1 The Light". Power is 2,000 watts daytime only. Darn, I missed it... [b]Yesterday[/b] was the 70th anniversary of the Big Shift of 1941. The vast majority of North American radio stations changed frequency, usually in blocks. A few stations, especially in Canada & Mexico, moved "out of pattern". 47-52-32N/122-04-40w, just north of Seattle. Application filed for new ethnic station. 1,000 watts day & night. Mutually-exclusive with CJWI-1610's application to move to 1410. Ace of Hearts Disc Jockey Service of Cape Canaveral, Florida has been issued a Notice of Apparent Liability for $13,000 for operating with excessive power. FCC engineers found the station, authorized for 61 watts of transmitter output power, to be operating at 172 watts. During the inspection, the station promptly reduced its power to the licensed 61-watt figure. Seven months later, in September 2010, the Commission received another complaint of interference, allegedly from W277AN. They found the station's field strength was again at levels significantly higher than should have been measured if the station was operating at licensed power. They inspected the station again, and found the transmitter operating at 140 watts, not 61 as authorized. They also observed the station using a two-bay antenna, instead of the authorized single-bay unit. This means that while the transmitter power was roughly twice what was authorized, the effective radiated power (and thus, the interference potential) was considerably more than twice authorized. FCC regulation 1.80 establishes "base forfeitures" for specific violations. The base forfeiture for excessive power is $4,000, and that for "unauthorized equipment" (the 2-bay antenna) is $5,000. The base forfeiture may be adjusted upwards (or downwards) as circumstances require. For example, the fine may be reduced if the station has no previous record of violations. In this case, because the station increased power back to 140 watts, after being informed that powers of more than 61 watts were unauthorized, the fine was adjusted upwards from $9,000 to $13,000. The licensee has also been directed to submit a sworn statement confirming that W277AN has been adjusted to its authorized power level and antenna system - or, to describe steps the station will take to come into compliance. (I might presume one such step will be to suspend operation until the proper antenna can be installed! -- or to request modification of the W277AN license to specify a transmitter power sufficiently lower than 61 watts that the station's coverage -- and interference potential -- are no greater with the unauthorized antenna than they would be with the correct unit. WNKX granted move from Centerville. Power to be decreased from 5,000 watts day/77 watts night to 1,000 watts day/66 watts night. Tower to move to 35-46-01N/87-49-52W, a move of roughly 22 miles due west. This move was required to allow FM station WFGZ 94.5 to move from Lobelville to the Nashville neighborhood of Bellevue. The FCC does not allow deletion of a town's only radio station; moving WNKX to Lobelville replaced the lost FM service. WNKX-FM continues to operate in Centerville, so that town does not lose its only station. Directional with different patterns day & night. Applications for new stations amended to specify new site. 1310 also amended to reduce nighttime power to 8,100 watts. CKKY granted move from 830KHz. Daytime power to remain 10,000 watts but to go from non-directional to directional. Nighttime power to increase to 9,000 watts. 250 watts day & night, directional at night. KBRV requests move from 790KHz. Power to 10,000 watts daytime, 150 watts nighttime, non-directional. KBNH requests move from 1230. Power to 12,000 watts daytime; 600 watts nighttime. Power to 2,500 watts daytime, 19 watts night. Fultondale is a Birmingham suburb. WGRK granted move from 1540 Greensburg. From 37-15-34N/85-30-57W to 38-11-04N/85-29-57W, a move of 103km/64mi. almost exactly due north into a Louisville suburb. Move granted over the objection of WAMB-1200 Nashville. WRRA license surrendered for cancellation. WKPR granted move from 1420KHz. Goes from 1,000 watts daytime/15 watts nighttime directional to 2,700 watts daytime/24 watts nighttime non-directional. No change in site. same transmission facility (and ownership) as existing Shawano AM station WTCH-960. Application for new station reinstated. In a decision today, the Canadian Radio-television and Communications Commission announced the licence of CKLN-88.1 Toronto has been revoked. The Commission cited questions of who controlled the station, which was apparently involved in a tug-of-war between two boards. They were locked out of their studios & transmitter room for several months, during which period the transmitter continuously broadcast a loop of programming hastily switched to air before the lockout. The loss of licence is to be effective February 12th. One Commissioner (and outside observers) believe the "death penalty" is somewhat extreme given the circumstances. There's a pretty good chance this revocation will be challenged. IBOC costs station sports contract? An article in Radio & Television Business Report suggests WDFN-1130 Detroit may have lost their contract to carry the Detroit Pistons basketball games due to interference from IBOC. The article blames KMOX-1120 and WRVA-1140. The Pistons' Director of Broadcasting confirmed to RBR that coverage issues -- "...a weak signal..." was the reason for the change -- he wasn't sure whether IBOC/HD Radio was involved or not. WGHC requests move from 1400KHz. Power to 2,800 watts daytime only, non-directional. WPNN denied permission to move from 780. Would have been 50,000 watts daytime only, directional. WPNN moved only last February from 790. Elk Grove is near Sacramento. WASG moved from 550 Atmore. Power from 10,000 watts to 2,500 daytime, from 143 to 19 at night. Station remains non-directional. Site moves to 30-44-44N/88-50-40W, closer to Mobile. Due to the lower interference level on 540 and the site closer to population concentrations, WASG probably reaches more people on the new facility despite the lower power. New station KGFR on the air. Malmstrom AFB is adjacent to Great Falls. The CBC has surrendered the licences of 14 Eureka 147 DAB transmitters, and the Canadian Radio-television and Telecommunications Commission has revoked those licences. There were two transmitters authorized in Windsor, Ontario, and four each in Toronto, Ottawa, and Vancouver. The Toronto transmitters were first authorized in 1998; the Vancouver outlets in 2000; and the Windsor and Ottawa stations in 2002. They never got much traction. Receivers were few and expensive. Of course, the USA went with a different standard, which eliminated any chance for economies of scale to reduce the price of a digital receiver in Canada. DAB is still [b]allowed[/b] in Canada, and there are still other-than-CBC transmitters operating. I doubt that will be the case much longer though. IBOC is now allowed in Canada as well. However, I know of no more than three Canadian stations using it. CKKY requests move from 830KHz. Transmitter site would not change; neither will daytime power of 10,000 watts. Nighttime power would increase to 9,000 watts. The 1080 frequency became available when CKSA Lloydminster moved from 1080 to 95.9 FM. Bethel Heights is in extreme northwest Arkansas, just south of Fayetteville. CHTK granted permission to move to FM. 99.1 with 160 watts at 578m. Same site as the existing 101.9 station there. Power increased to 22,000 watts daytime, 8,000 watts critical hours, 9 watts night.